On December 15th 2016, HDB hosted it’s first Wrap Up Party for more than 90 Delray Beach residents and professionals at Pompey Park. 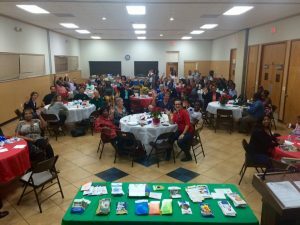 The Wrap Up Party represents a shift from community “meetings” to community “gatherings” meant to introduce residents to their neighbors and foster a sense of community in Delray Beach. Residents were encouraged to interact and connect with their neighbors, whether through the multicultural food that was served, the random seating assignments meant to connect new people, or the table art project. Another way that HDB encouraged cross generation connection was with an activity all about getting to know people that were not at your table. Each table had a gift box filled with instructions like, “Find someone who was born in Delray Beach,” “Find someone who’s new to Delray Beach,” or even “Find someone who knows how to fix a toilet.” Residents walked around the room looking for someone who matched the criteria before trading cards and making a new connection. The room filled quickly with laughter as neighbors and residents formed new friendships and connections. The Wrap Up Party was an opportunity for residents to strengthen and expand their social support system, one of the most effective ways to improve your behavioral health. HDB doesn’t just want to make Delray Beach a friendlier, or better connected place to live, we also want to change what it means to be a neighbor in Delray Beach.